The Skywards Dubai International Jazz Festival is celebrating its 10th year of spectacular live entertainment at its new home at Dubai Festival City. The Festival will feature a chilled atmosphere with comfortable seating and seating-free zones alongside a specially created Food & Beverage zone by InterContinental Hotel-Dubai Festival City. You want want to miss the 4th edition of the popular Jazz Garden which kicks off on 18 February, 2012 at Dubai Festival City. The event offers five nights of live jazz gigs, where fans can enjoy a wide selection of unique performances from legends to contemporary new performers and musicians. Each of the five nights will host three shows, with the opening acts featuring leading Italian Jazz bands, while the second and third shows will offer a global pick ‘n’ mix of smooth jazz artists and Rhythm and Blues best acts. The cozy and exclusive atmosphere will compliment the Jazz Garden’s remarkable bounty of the industry’s finest names. An experience no jazz aficionado will not want to miss! 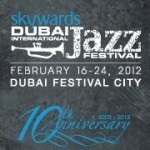 Admission to the Jazz Garden is free through online registration which opens 15 January, 2012. The Main Gigs, will be hosted over two weekends. Ticketed mega concerts featuring international pop stars all taking place at Dubai Festival City. The three days will feature three concerts per night starting February 16 and finishing up on February 24. Jools Holland & his Rhythm & Blues Orchestra live on Friday February 17, 2012. James Morrison live on Friday February 24, 2012. Totally brand new venue! Not the festival car-park venue that you may know! The venue is a newly grassed area near Al Badia Golf Club at Dubai Festival City. Tickets are available online from Ticketing Co, Time Out Tickets and Virgin Tickets. Physical tickets are available in-store from 10 January at the following outlets; Virgin Megastore, Spinneys and Hallmark.